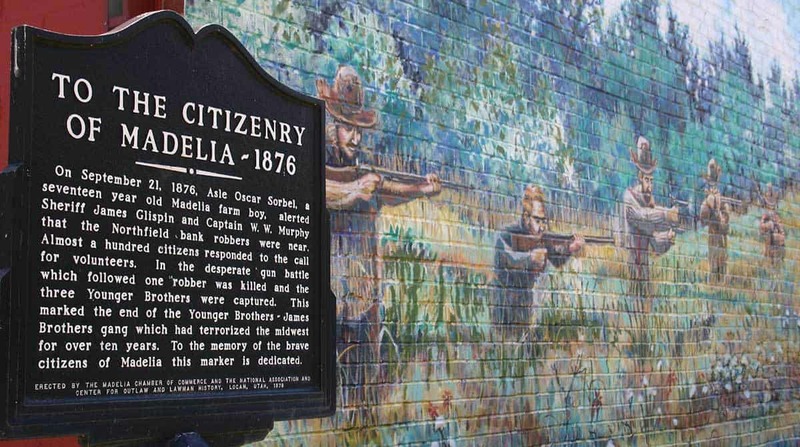 Madelia, “Pride of the Prairie” was established September 10, 1857. It was originally named Wapaca, however, within a year the name was changed to Madelia in memory of the deceased daughter of one of the founding fathers, Philander Hartshorn. The history of the area is preserved by historical markers at Fort Cox, Fort Slocum, Fort Hill, and the Ashippum Post Office. Fort Cox was constructed in 1862 during the Sioux Indian uprising. Just west of Madelia is a historical marker erected where the Younger brothers, members of the Jesse James gang, were captured shortly after the Northfield bank robbery. The Watonwan County Historical Center is located in Madelia and contains a cabin and a covered wagon dating back to 1857, as well as artifacts, books, papers, and pictures that tell the history of the early pioneers in this area. Another historical landmark of Madelia is the Warren Truss Bridge, believed to be the oldest of this type of bridge in the state.